I sit by the Christmas tree – a ragged little miracle. The front lacks appropriate branches, and so the white goat on wheels lilts strongly toward the center, as do the handprint snowmen and jack-in-the-box. The wooden cranberry garlands hold on the best they can. We picked our eight-foot tall noble fir from Mike’s Tree Farm this year, just as we’ve done every Christmas for the last 14. On the final leg of a five-hour road trip from our family’s Thanksgiving in Southern Oregon, it was our earliest foray and nearly our most disastrous. Mike (of Mike’s Tree Farm) and his family have always kept on the porch a coffee can for our $10 a tree payment, as well as a few bow saws. 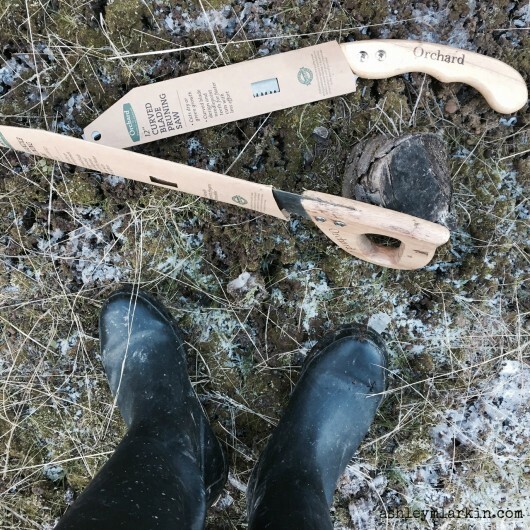 Saws, as it turns out, are very important when it comes to tree cutting. We’d strapped on our mucking boots and donned our warm coats, hats and gloves before we realized it: No saw. No way. Not exactly a tourist destination, this “U-cut any noble for $10” farm, far far far off the beaten path. The oldest and I began to cry – her with the fear of breaking a dear family tradition, me with the fiery kinds that come before a mama bear takes action. Within thirty seconds, a neighbor pulled around the side of her house on a riding lawnmower to park inside the garage. Everyday tools hung from the walls. When I explained our predicament, she passed two saws over the fence for us to choose from. (“Just throw ‘em over when you’re done,” she said plainly.) 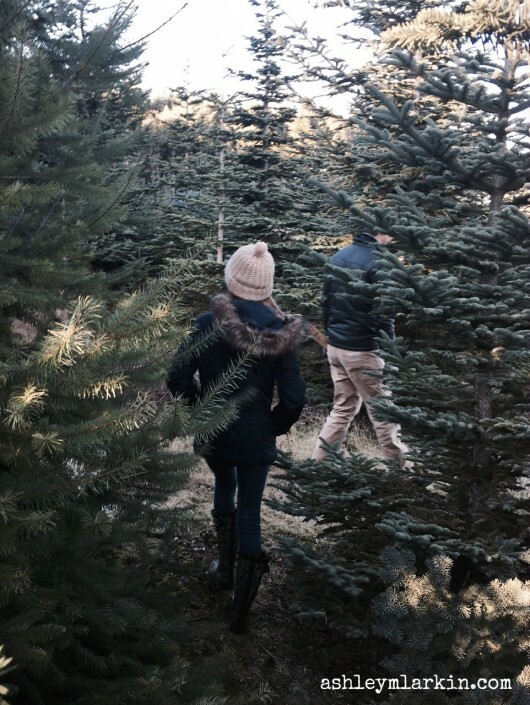 And we tromped off gleefully to find our trees – one for the girls to decorate in the basement, the other for our living room. We found both in record time, cut them with the borrowed saw, tied them to the car, poured hot cocoa from the Thermos and drove the long way through downtown, as we always do. Past Pioneer Courthouse Square and the giant tree, past bustling shoppers, across the bridge and home. As the girls and I unpacked from our trip, Michael cleaned off the trees on the front porch. When he’d prepped the trees – the one for the basement by lopping off the top (presumably the quickest, end-of-a-long-road-trip solution to get it down the narrow staircase and clear the low ceiling), Michael brought in the tree I’d identified as the living room tree – and I realized my mistake. It was a short squatty thing, barely six feet tall. We swapped with the other tree – our living room tree, now lopped off and a sad, sorry sight. Slightly dejected, we sat down to dinner and tried to come up with a solution. Flash forward a few hours, then another day to an elevated stand that brought the height of the originally-intended living room tree up another eight inches, followed by our ingenious (if I do say so myself) idea to screw the cast-off top back into to the tree. Now the tip-top lilts to the right, a (not-surprisingly) off-green color. Perhaps sensing that something is off on its portion of tree, the top light strand often doesn’t go on with the others. So we jiggle them, which sometimes springs them into action. Combine this with the saggy front, and it’s definitely the year of our own Charlie Brown-esque fir. Somehow this screwed-together tree, covered in treasured family ornaments and crowned with a watercolor and glittered star made by the girls, is a reflection of my own Christmas journey these last few years. During the season of Advent, I’ve moved from trying to create an ideal journey to the manger – attempting to absorb every good tradition into our own, infusing magic into every piece of Christmas wonder – to simply receiving the good of what is. This wonky, off-kilter evergreen, the stories in its light, the base surrounded by the girls’ gifts to each other, the everyday of their bickering mingled with instrumental Christmas carols. To my own surprise, I find myself searching for and storing away not only tender moments like Mary, but, too, the lilting, off-color imperfections, the sorrows woven right through the fabric of this season, this world. All continual reminders for why Jesus, the glorious light, need come. Merry Christmas, dear ones. I am praying that you know the peace and tender imperfections of this season and, more than anything, this God with Us, Immanuel. Jesus come down for us. I love you. Loved this, my friend! Adding it to my Christmas version of TTIDN – because, of course! We are so snowed in, but I still dream of a road trip to see you! Soon – but not soon enough! Merry Christmas, sweetie! That tree seems to be a metaphor me…a little wonky at times, so thankful Jesus came to be with us, is with us still. Merry Christmas, sweet Ashley! So very well said, Ashley….I came to the shocking realization last week that I can’t do All the Stuff of Advent, the traditions, the candles, the readings…it’s not me; it’s not us. Here’s to what’s us–Jesus right where we are. Ashley, I miss you. Thanks for sharing your journey with us. I would love to see your Charlie Brown tree. I bet it’s beautiful. Love this! And that’s us too! Real life! Only we have you beat by five bucks! Yet I bet ours is even more Charlie Brown-ish! I adore you friend! These are the best moments…the best stories…the ragged ones, lopsided and pieced together in all their glory. How I love the way you tell them. Thank you. These not so perfect Christmas memories make the best family stories years down the road. Trust me on this! ? Have a blessed Christmas, my friend! I loved this testimony story! Yes, it brings us good-intention/ lets-make-everything-awesome-homemade-and-spiritual Mamas down when we put our hands too much into “experiencing Christmas”. I am so thankful for Ann Voskamp, she is “a voice crying in the wilderness” for the women of our generation, to simply be still and receive the great gift promise of Christmas, not just at Christmas but in the messy, boring everyday. Your story perfectly illustrates this.